SEPTEMBER ISSUE: Looking at the future of densification — on newsstands August 26! From condo towers to low-rise infills, this issue investigates the densification craze and showcases some stunning examples of infill done right. So, have you noticed the difference? 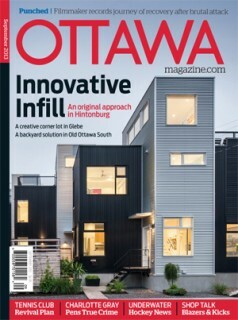 This edition marks our first redesign of Ottawa Magazine in eight years. If we’ve done a good job, you’ll feel the new energy as you flip the pages, though perhaps without being able to put your finger on exactly what’s changed. That’s what we’re hoping, anyway. The key to a successful magazine redesign is in its subtleties, the aim being to stay true to the Ottawa Magazine that you know and love while tweaking the typography, colour palette, and structure to reflect the times. We know we’ve got it right if September feels fresh and lively, the stories easier to navigate. We began this ambitious task some 18 months ago when the editorial team sat down with design consultant Pegie Stark Adam. As our redesign coach, she put us through our paces, challenging us to look at who we were and who we wanted to be. We dissected dozens of magazines, analyzing what elements worked and why. Stark Adam talked us through colour theory, helping us choose a palette that is uniquely Ottawa. She took us deep into the world of fonts, having us analyze typefaces for their legibility, the mood they created, their impact. And she dared us to take a second (and third) look at many design and editorial elements that we’d taken for granted for years. That was the fun part. Then came the grunt work, with Ottawa Magazine art director Jane Corbett and consulting designer Ryan Mesheau putting knowledge into practice, page by page, detail by detail, until the magazine came together again as a whole. From grids and fonts to story placement to that tiny “end slug” at the close of each story (see how it connects back to our logo? Cool, right? ), the goal all along has been to translate redesign nerdiness into an awesome read for you, the reader. So read on with a discerning eye — and do tell us what you think. This issue’s cover story shines the spotlight on urban densification. It’s the mantra at city hall, a bone of contention at community association meetings, and a top-ten topic of water-cooler conversation. What does it mean to live closer to your neighbours and how can we make infill happen more seamlessly? As the allure of urban living gains traction, we look at the pace of change and the issues before touring a number of smart (and striking) infill projects that are doing it right. On a personal note, September marks my last issue as editor of Ottawa Magazine and I would like to take this opportunity to thank you all for the amazing ride. I have enjoyed a fabulous seven-year run as editor and 15 years, in total, with the magazine. I’ve watched it grow from a skinny 80-pager to a beefy 96-plus-pager with the help of dozens of talented writers, photographers, and illustrators. I’ve always felt the best part of the job is working with smart and creative people to design stories that both entertain and inform, compelling us all to regard our city anew. I’m very proud of how the magazine has developed and grateful to everyone who has supported it, helping us maintain a strong voice for this city. I look forward to watching the redesigned Ottawa Magazine as it moves in new directions and rises to new heights.